The Smith chart, invented by Phillip H. Smith (1905–1987), is a graphical designed for electrical and electronics engineers specializing in radio frequency (RF) engineering to assist in solving problems with transmission lines and matching circuits. An article appeared in the January, 1939 issue of Electronics that changed forever the way radio engineers think about transmission lines. Phil Smith devised an extraordinarily clever circular chart that revealed graphically the complex impedance anywhere along a line. 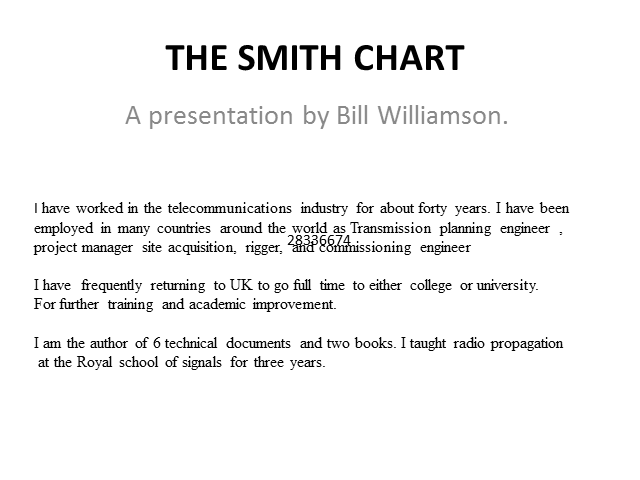 This webinar is designed to introduce young RF engineers who may never have heard of the Smith chart to its immense power. We all use it unknowingly every day when because it is built in to so many systems that we do not even know it is there. The chart is simply the unit circle of the complex plane representing the generalized reflection coefficient. The contours representing constant real and imaginary line impedances are overlaid . Thus, the chart can be used to directly determine the normalized line impedance at any position of the transmission line as well as the reflection coefficient. The chart is also a unit’s converter. No mathematics are needed because all quantities are simply determined graphically. So ingenious was his invention that it has been the standard of the industry - for nearly sixty years. I am going to show you just how simple it is to design a balun to match a transmission line to an antenna. PLEASE NOTE: Please be sure to leave your correct email address when registering as you will be sent a copy of The Smith Chart for this exercise. You will also need a pencil, 12" ruler and compass/divider. I hope you enjoy the exercise. To fix a configuration that drifted from the desired state. This is the description of Windows PowerShell PowerShell Desired State Configuration. Who doesn’t know the long search for the cause when something stopped working? Two identical servers, where one works and one does not. You can solve this by standardization and compliancy enforcement of that standard. DSC is all about that. You define a state you want the configuration to be in and hold this against a server or client. If it isn’t compliant with the desired state, it will get fixed. This is the future of management in Windows environments. During this webinar, Jeff will show both how DSC can be used for compliancy enforcement, but also as a deployment solution. Bio: Jeff Wouters, MVP Windows PowerShell, is a freelance consultant and trainer from The Netherlands with a main focus on automation and virtualization. He has a passion for Windows PowerShell, is the founder of the Dutch PowerShell User Group (DuPSUG) and frequent speaker at national and international IT events such as BriForum, E2E Virtualization Conference, Microsoft TechDays and multiple User Groups. He blogs on http://www.jeffwouters.nl and the Hey!ScriptingGuy blog. Jeff is one of the contributing authors to the PowerShell Deep Dives book and an active social media user where you can find him under 'JeffWouters'. Tales of Agile recruitment. Some of the techniques we use to reduce the effort involved in recruiting but still making sure we employ the right people. With over 1,000,000 apps in Apple's app store alone, getting your app seen amongst all the competing apps is an increasingly important and specialist activity, even apps that don't compete with you on a product level compete in search results. Forrester research shows that over 63% of apps are discovered through organic app store search alone, and over 75% of apps are downloaded with no prior knowledge of the app's existence. Smart Phone and Tablet search behaviours are changing, we've seen a 6% year on year decline in Google Search via mobile, but a staggering 1,000%+ increase in app store browsing. Big brands can no longer rely on customers searching for them by brand, customers increasingly use app stores to search for products like Linen as opposed to the retailers like John Lewis who might supply them. This webinar seeks to introduce you to the key challenges, and how they can be overcome by focussing on getting the best out of the app store ecosystem. Over the last few years the issues with cybersecurity have created this impression that cyber is a virtual world that has no end to it. What people fail to realize is that there is still a physical computer network and automation infrastructure under this virtual world. It is the security of this infrastructure that provides for secure transaction of the financial data, sharing of sensitive data, and mission critical information. One of the best approaches to securing the cyber domain in addition to training people and establishing policies is the security of the cyber domain through the implementation of an enterprise asset management discipline. Knowing what assets the enterprise has and what it is being used for provides a high level of situational awareness that is needed to protect the cyber domain. Join cyberscurity veteran Zal Azmi for this interactive presentation, with decades of experience as CIO of the United States Attorney and the FBI, there's not a lot he doesn't know about your infrastructure. Connectivity requirements of the latest LAN/SAN devices are forcing changes in the way physical infrastructure is designed and implemented from traditional structured cabling. New technologies such as PON, TORS, pre-term and modular systems are giving data center and network managers new flexibility in the way they plan and deploy the physical layer. Join David Cuthbertson and Bob Camerino for this webinar where they will cover these new developments and their impact on network infrastructure planning and management. Looking at how ig.com has been engineered to provide a fast user experience. This seminar will cover a number of the web design best practices which had the biggest impact on performance. What are the main challenges of running video on a mobile network? What does a good video experience look like? The move towards an end to end mobile video ecosystem. Thinking about creating a startup? Looking to progress your career? Enthusiastic about expanding your technical skills? Whichever it is, mobile development offers huge opportunities for developers. This talk will consider the three essential areas that will enable you to make a success of mobile development. First, when to develop a native app, and when to stick with a mobile web experience. Second, which platforms to use, and how to use them. And third, using tools to run your mobile programme smoothly and effectively. Das Projekt Berliner Flughafen ist ein jedem in Deutschland geläufiges Beispiel eines fehlgeleiteten Großprojektes mit immensen finanziellen Schäden und Reputationsverlust. Das Webinar geht auf die Frage ein, ob agile Methoden ein derartig katastrophales Scheitern von Projekten verhindern können. Werden Releasestrategien helfen, Projekte zu festigen und Risiken frühzeitig zu erkennen? Das Webinar untersucht insbesondere den Einfluss von Change Requests und beleuchtet Techniken, deren terminliche und finanzielle Auswirkungen mit agiler Vorgehensweise zu begrenzen. In this webinar we'll explore why product management is a strategic function, and how as a product manager you can take control of your career and actualize your potential. The inherent complexity that exists in product management encourages some companies, product directors and even product managers to simplify the role. This process of simplification moves the product manager away from being at the heart of the organizations strategy to a service delivery function. This is not product management. Diverse, multifaceted, complex, exciting, strategic: Organizations must see Product Management in these terms, not as the slow track to mediocrity, but a fast track to senior management. "Aziz Musa (@azizmusa) is Digital Director at Pegasus, an integrated communications agency. Prior to this Aziz was Commercial Director at PhotoBox/Moonpig.com where he also held various other roles including Global Product Strategy Director and General Manager of Australia. Previous companies he's worked for includes Lastminute.com, holiday autos, Travelocity, Reed Business Information, and a host of other companies in the UK, Europe and the Middle East. The hunt for the golden lamppost – The challenges of deploying a small cell network. Simon is an independent specialist in the technology of wireless communications, with a technical and commercial background derived from senior appointments in both industry (including Philips and Motorola) and academia (University of Surrey). As co-founder of independent wireless strategy advisory firm Real Wireless, he is responsible for overall technical capability and direction. He is an author of over 150 articles, books and book chapters. He has acted as a consultant to companies including BAA, BBC, O2, Ofcom, BT, ntl, Mitsubishi and British Land and was CTO of Red-M and CEO of Cellular Design Services Ltd. Simon speaks and chairs a wide range of international conferences and training courses and has invented over 15 patented wireless technologies. Particular expertise includes in-building wireless systems, radiowave propagation prediction, smart antenna design and mobile system analysis. He has served on technical advisory boards of several companies, was Visiting Professor to the University of Surrey, member of the industrial advisory board at University College London and was founding chairman of Small Cell Forum (formerly Femto Forum), which he chaired from 2007-12. He is currently a member of the Ofcom Spectrum Advisory Board, an advisor to Quortus and an Adjunct Professor at Trinity College Dublin. One of the most fundamental principles of agile is often misunderstood and forgotten when organisations implement scrum. This talk will explain why Agile requires a mindset shift and you need to replace defined process control with empirical control. How through transparency, inspection and adaptation the best processes are emerging while you're working, and only retrospectively it is possible to recognize successful adaptation from non successful ones. Niels has worked in the industry for 15+ years as a Developer, Architect, Development Manager and a freelance Consultant. Most of his career he has been involved in agile and lean projects, from XP and Scrum to Kanban. The last two years he has been working as an Agile Coach, currently for agile42. As corporations mature, they find themselves losing the spark that gave them success in the first place. I will present a play book on how to get the mojo back. I will also discuss the advantages of larger companies and how you can have the best of both worlds. This talk should be relevant to anyone who wants to make changes, be more influential or start revolutions from the ground up. After 30 odd years in the SW industry as a developer/project manager, Development Manager, Trainer, Consultant and now Scrum Master, I am experienced in many of the Agile frameworks and have trained/consulted many small to large companies on introducing Agile to their teams. I passionately believe that using the Agile principles any project can be completed successfully. If you can get your teams/companies to buy into the "communication and collaboration is key" and "working software" is the best way of getting feedback early and often then you can only fail fast or succeed well. Davina is a freelance consultant and agilist who is most often engaged as a troubleshooter on large, complex IT delivery programmes. Before setting up on her own she was a principal consultant at ThoughtWorks and recently worked with the UK's Government Digital Service, a team described by Tim O’Reilly of O’Reilly Media as “the best digital team working in government anywhere in the world”. Prior to that she spent many years specialising in test and delivery management within investment banking. A lot of Agile coaches and consultants talk about “guaranteed success” with Agile, but Agile done well provides exactly the opposite, in the form of fast failure. Not every project is realistic, and some of the most innovative will always be doomed to fail. In this webinar, find out why that’s the case, what to do about it, and how to influence others to recognise that failure, while inevitable, may not always be a bad thing! Liz is an experienced Lean and Agile consultant and well-known international speaker. Coming from a strong technical background, her work covers a wide variety of topics, from software development and architecture to psychology and complexity thinking. She is best known for her involvement in the BDD community, and was awarded the Gordon Pask award in 2010 for deepening existing ideas in the space and "coming up with some pretty crazy ones of her own". Everyone loves dinosaurs, right? They are ancient wonders, and they are really, really big, inspiring a sense of awe. However, they are also extinct, and however much we may be fascinated by them, we are glad they aren’t still around, over-exploiting resources and occasionally having one of us for lunch. They died out for a reason: theories abound, but something changed in their environment that they couldn't adapt to. Surely no company wants to be described as an overgrown monster that frightens people and can’t adapt, right? But many companies now are just that, and they are being out-done by the business equivalent of tiny mammals: start-ups and SMEs. These kinds of small furry businesses are out-evolving the huge ones, through their ability to quickly adapt to changing business environments. In this webinar, we will talk about exactly how small businesses are doing this, and how yours can do too. Stephanie Hopper is a strengths based executive coach and facilitator whose trademarks are her energetic approach, can do attitude and positive mindset. She specialises in working with technologists who reach a point in their career where getting the most out of their teams is their number one success factor rather than the pride they have previously enjoyed in their programming! At this webinar she will share some tips on how to make the most from our interactions in teams, with stakeholders and our users. Being a member of the solutions delivery (typically scrum team), the subordinate ‘s lament is an inherent part our daily lives. We are uninformed, working for the inaccessible, are trying to do the impossible for the ungrateful business portfolio team. Unfortunately, this feeling is mutual among business and the delivery team. One of the symptoms of continuous lamenting is rooted in our inability to impact the programme, portfolio and longer term vision within the organization. A critical root cause is the lack of ability to collaboratively manage changing priorities. Business and solutions delivery organizations are always busy in fire fighting the much required accelerated time to market and don’t get the opportunity to think innovatively. In this talk - we will explore the practical initiatives for getting the team to contribute at multiple levels iteratively, incrementally and best of all – collaboratively. It is a culture change - a paradigm shift from traditional practices to the new continuous innovation and disciplined execution mind-set. Co-founder of management consultancy www.morphilibrium.com, Naveed is dedicated to coaching both executive leaders and the delivery team in best practice, sharing advice and more than anything - changing the linear mind-set into the iterative, incremental and collaborative model. For All Agile & Telecoms enthusiasts either with extensive experience or looking to gain an inside track into the newest techniques being used, or even wanting to know how to introduce formal Agile practices into your business. We'll have regular speakers along with a few social drinks afterward!